You’ll swoon for this creamy, frothy Pumpkin Spice Latte! It’s just like your favorite coffee shop makes but without all the sugar and other junk. 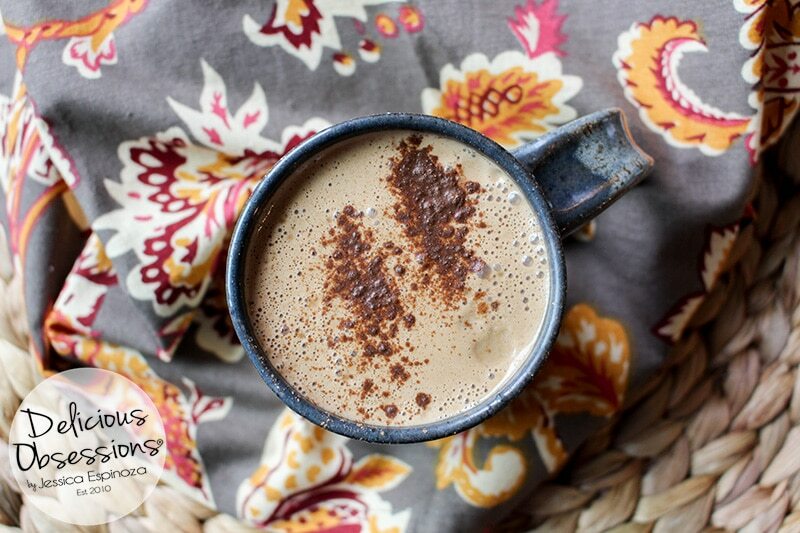 This deliciously rich beverage is the perfect way to usher in Fall and only uses real food ingredients that won’t leave your blood sugar on a roller-coaster all day long. 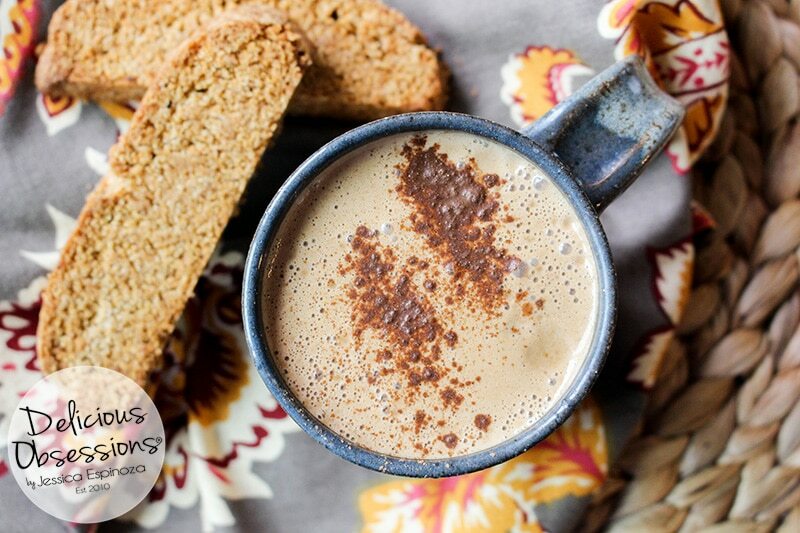 Completely customizable to suit your own tastes and dietary needs, this pumpkin spice latte recipe is sure to become a family favorite in no time! If you’ve been a reader of this website for any amount of time you know that I have a total love affair with anything pumpkin spice latte related. Well, anything pumpkin spice actually. I personally enjoy pumpkin spice throughout the year, but I keep it relatively under wraps until fall rolls around. But at the first glimpse of Fall, I let my pumpkin spice love shine for all the world to see. Many years ago when I was still eating more of a Standard American Diet (SAD), I lived on pumpkin spice lattes during the fall and winter season. Yeah, there are some days where I would drink two of them. And, quite often I’d pair it with some sort of pastry too. A pumpkin spice flavored pastry of course. My favorite was Starbucks® Pumpkin Cream Cheese Muffins. Dang, those were good. Good thing I recreated the recipe for those Pumpkin Cream Cheese Muffins (recipe here). But I digress. This post is about pumpkin spice LATTES, not muffins! My Starbucks® addiction was deeply rooted because to be 100% honest, I was working a job at the time that I was not happy in and food was a big source of comfort for me. Plus it didn’t help that a couple of my really good friends at that said job were also Starbucks® addicts so it made going to coffee shop down the street before work or during our lunch even more fun. There’s nothing like getting out of the office and complaining about everything (and everyone) that was bugging us that day. And all of that over a hot, frothy, sweet concoction of pumpkin spice coffee goodness to boot. Food is a sensitive thing. 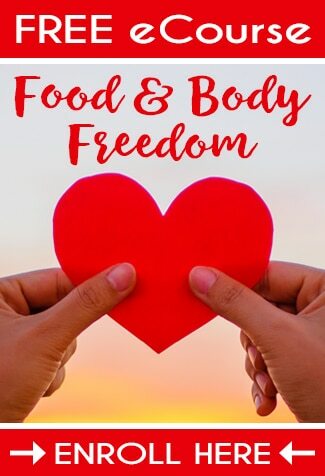 Since this time in my life I have learned so much about teh role that food plays in all areas of our health — mind, body, and soul. I think back on this period of my life and have deep compassion for myself because I was simply doing the best I could to cope with a lot of stress and uncertainty. Since then I’ve had to give up coffee because I discovered it was a serious migraine trigger for me. Sad face. I still go to coffee shops for tea here and there and the aroma of freshly ground coffee beans delights my senses every. single. time. There are times that I really do miss coffee and I wonder if it misses me… Well, I doubt it does, but I bet Starbucks® probably misses all the money I used to give them. LOL! Also, I have since given up the Standard American Diet as well and now I kinda cringe at how much sugar I was eating at that time. Not to mention all the dairy (cue whole milk and whipped cream!) which was certainly not sitting well with me (even though I didn’t know the symptoms of my dairy intolerance at the time). In just a brief glance at the pumpkin spice latte nutrition calculator on the Starbucks®, I can see that I was consuming 64 grams of sugar per latte… Eek! OK, it’s not just pumpkin spice lattes that get me excited. It’s pretty much pumpkin spice anything. 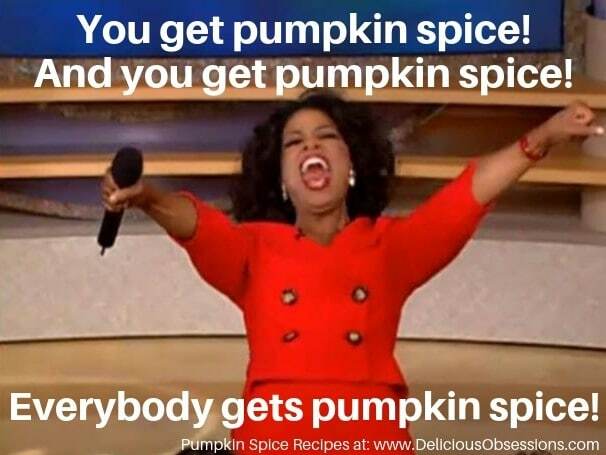 That’s probably why I have so many pumpkin recipes on my site… I am simply addicted. What can I say? I love pumpkin, and pumpkin spice, and I cannot lie. And, I even have a non-food pumpkin recipe. Who wants to try this amazing Pumpkin Sugar Scrub? Pumpkin all over, pumpkin for everyone! Recreating my beloved pumpkin spice latte was at top of my to-do list once I switched to a real food diet. We published one on this site a few years ago (which you can check out here), but I have since updated that version and today I’m sharing that new recipe with you. Just in time to usher in fall wherever you are. Oh, and Fall certainly has come here to Denver. As I sit here writing this, we are actually forecasted to have snow tonight. Say whaaaat?!! Quite honestly, I welcome the cooler weather, and yes, even the snow, because this was an exceptionally hot summer and I don’t do hot. Unless it’s a hot pumpkin spice latte that is. Regular or Herbal? It’s Your Choice! For this recipe, you can use regular coffee or you can use any coffee substitute of your choosing. If you can’t do coffee, I’ll list a few of the most popular coffee substitutes below. Keep in mind that when you are looking for a coffee substitute that many are made from gluten-containing grains. So if gluten is an issue for you, you need to make sure you read the labels. I personally like to use my own herbal coffee substitute blends, which I used to sell via Etsy. Remember that? Can you believe it’s been over 3 years since I closed down production of those? 🙁 I still miss that part of my business, but I am so honored that I have been able to reach more people than I ever could on Etsy with my best-selling DIY Herbal Coffees eBook: A Complete Guide To Making Delicious Herbal Coffees to Support Healing & Stress Relief. Oh, one more thing before we get into the recipe! One of the secret ingredients that I add to all of my hot drinks is collagen powder. Not only does collagen powder give you a boost of nutrition via easily digested amino acids and protein, but it also helps improve the mouthfeel of beverages like this, making it smoother and creamier. More like the drink you would get in your favorite coffee shop — though the thickness of those beverages are often due to the sugary syrups they use for sweetening and flavor. The collagen is totally not required, but it definitely makes a difference so I encourage adding it if you have some on hand. The brand I use (Perfect Supplements) is completely odorless and tasteless so you won’t even know it’s in there. 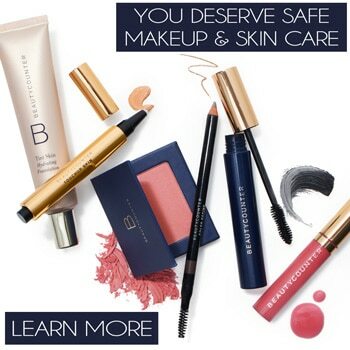 And, it’s REALLY good for you hair, skin, and nails so what’s not to love?! Alrighty! Who’s ready to dive into the newly updated Pumpkin Spice Latte recipe? Let’s go! Remove from heat and place in blender with all of the other ingredients. Blend until completely combined and frothy. Pour into your favorite mug and savor. Place all ingredients in a small saucepan and heat until hot. Using an immersion stick blender (like this one) or a milk frother (like this one), blend until combined and frothy. Special 50% OFF Coupon Code for My Best-Selling DIY Herbal Coffees eBook! To celebrate the publication of this newly updated recipe, I thought I’d share a special coupon code with you guys today! 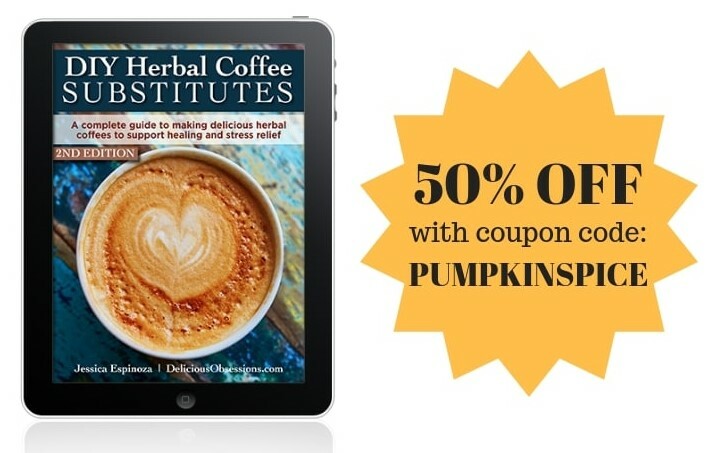 Right now, you can take 50% off my popular DIY Herbal Coffees eBook using coupon code PUMPKINSPICE. This comprehensive digital resource will teach you everything you need to know about making your own healthy coffee substitutes at home, using just herbs. No grains, no gluten, no trace amounts of anything, no cross-contamination. Just time-honored, nutritious herbs that not only taste like coffee but help support your body’s overall function throughout the day. In addition to receiving access to my proprietary formulas (the exact ones I was using when I was selling my blends pre-made on Etsy), you’ll also get a ton of information about why caffeine and coffee might not be supporting your health (especially if you have any type of chronic illness). Lastly, you’ll also get a whole array of coffee shop inspired recipes for beverages and pastries, so you can recreate the feel of your favorite cafe in the comfort of your own home. And, did I mention that all of the recipes are 100% real food based? No refined sugar, grains, oils, etc. in this baby! Click here to learn more and snag your copy for 50% off today. Or, just click on the image below! Ok, the drink alone is enough to make you run out and get all the ingredients, but now I need that gorgeous mug too!!! Please share where I can find one too :). Also, what are those biscotti-looking goodies next to the mug-o-deliciousness?